The OMSA Educational Seminar Program became part of the OMSA Convention experience in 1988. These convention seminars serve the purpose of OMSA by encouraging the sharing and transfer of knowledge regarding worldwide orders, medals and decorations. It is also a great chance to see and hear about seldom seen and rare material. The American Seminar Program was started by Al Gleim and is now hosted by Ron Fischer. Likewise, the British & Commonwealth Seminar Program was started by Nathan Weiss and is now hosted by John Allgood. International Seminars were later added to the program by Vicken Koundakjian and are now hosted by E. J. Fischer. Nathan Weiss remains in the capacity of Overall Seminar Chairman. The lists below contain a record of OMSA Educational Seminars and the speakers at OMSA Conventions since the inception of the program. The list is not entirely complete and will be updated if and when information becomes available. We would like to acknowledge all their hard work in helping make our OMSA Conventions more successful. 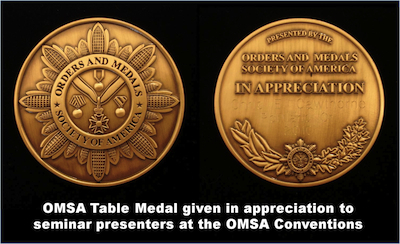 Seminar speakers are now presented with an OMSA Table Medal (engraved with their name) at the convention in appreciation of services rendered. Interested in giving a seminar in the future? If so, please contact Nathan Weiss, Overall Seminar Chairman, Ron Fischer (American seminars), John Allgood (British & Commonwealth seminars) or E. J. Fischer (International seminars). They will gladly assist and guide you in making it an experience you will not regret.